Keeping bees isn't rocket science, but it also isn't as easy as setting up a hive and sitting back to collect gallons and gallons of honey. It's true that bees will produce a bounty of sweet, liquid gold while pollinating flowers and crops for miles, but it takes some effort on your part to ensure that your busy little insects have a safe, clean home and that it's put together properly. You can purchase the hive compartments and screens, but you'll need to provide a sturdy base for them to ensure that your hives won't tip over. Set three of the cinder blocks in a row next to each other. Lay them so that the solid sides are on the top and bottom and the openings are on the sides. Set them close together so that they're adjoining. You should be able to look through one of the open sides with an unobstructed view to the other side. Lay a fourth cinder block next to the first three, also with the solid sides on the top and bottom. The fourth block will lie so that one open side is abutted up against the solid end pieces of the first three blocks. It won't be quite long enough to meet the ends of the first and third blocks, so just center it using the second block as a reference. Stack three more cinder blocks on top of the first three blocks you laid out, matching up the ends to create a solid base. These will also be laid so that the solid sides are on top and bottom and the openings align on the sides. Place the final block on top of the fourth block in the same manner that you placed the fourth block, abutting one open side against the solid end pieces of the fifth, sixth and seventh blocks.  Place your base on solid, level ground. Even a sturdy base can tip over if it's not sitting on a stable surface. 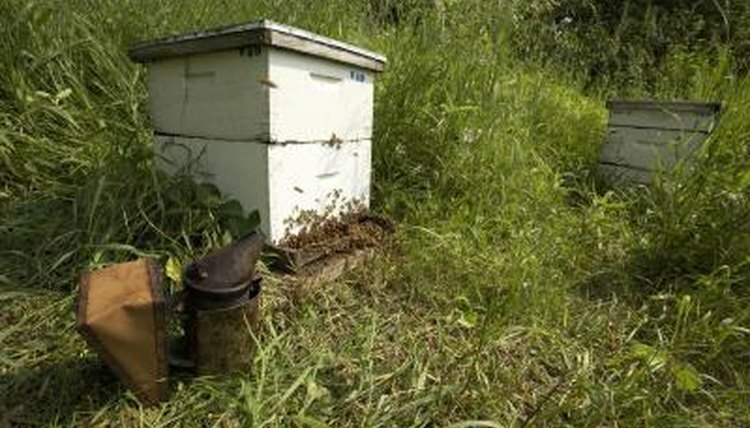 Mother Earth News: Keep Bees, Naturally!